Lochinvar Crest is a modulating condensing boiler with fire-tube technology. It's a fully modulating-condensing boiler. This commercial boiler comes in sizes that range from 1.5 to 5.0 million Btu/hr. The Lochinvar leading-edge technology will save money in the largest applications. 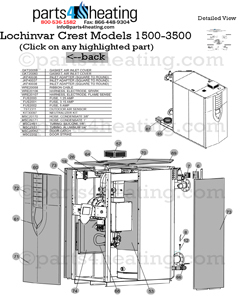 We stock many of the parts for Lochinvar Crest. Parts4heating will provide any part you may require but if we do not have it in stock, Lochinvar reacts very quickly and ships within 24 hours for many of their items. 25:1 turndown means the burner can fire at a rate as low as 4% of its maximum input. For example, a 2 million Btu/hr CREST unit can modulate from 80,000 up to 2,000,000 Btu/hr depending on demand. High turndown greatly reduces “short cycling” when demand is low. All boiler systems are designed to provide enough heat to maintain a facility’s heat loss on the coldest days. When the system is zoned, the CREST’s high turndown works to match the actual system demand and, in return, reduces the customer’s fuel bill and provides better comfort by load matching the heat loss of the system. Greater seasonal efficiencies will be realized due to the extremely large turndown offered by CREST. (Web Update 12/12) FG-7.5M-8/12 ©-Printed in U.S.A.